The Mini O shows some promise in the budget security camera space and provides an Alexa Skill to boot. But it's lack of free cloud storage and higher price tag over the WyzeCam holds it back. The past few years have seen an influx in DIY security cameras entering the market. No longer were you burdened with hiring a security company to set up an intricate system that required a long term contract. Now you simply need to order a camera and have a smartphone by your side. While names like Arlo and Nest have dominated this field, a line of budget cams have carved out their niche providing similar features at a third of the cost. The Mini O by EZVIZ falls in to that category. The EZVIZ Mini O doesn’t scream at you with it’s specs on paper. It’s 720p camera is the bare minimum in home security cameras today. It connects directly to your existing Wi-Fi like almost all it’s competitors. And while it’s features like night vision, motion detection, and a friendly mobile app are nice, they don’t stand out from the rest. But what does separate the Mini O is that it’s one of the only budget security cameras with a video enabled Alexa skill. Meaning you can watch your feed from an Amazon Echo Show or Echo Spot with a simple voice command. At first glance the Mini O was much smaller than I expected. It’s right around 5 inches in height and weighs just over 4 ounces. It has an attractive oval design that reminds me a bit of an alien head and comes in either a white or pink finish. It’s about as discreet as you’ll find a camera today. The back features a rather impressive speaker alongside a slot for up to a 128GB micro SD card. It powers itself via USB and comes with both a charger and 10 foot cord which is nice at this price point. Perhaps the only minor gripe is the lack of an ethernet port for those who’d prefer wiring their camera directly to their router. The EZVIZ Mini O sports a flexible base that allows you to turn the camera to the angle you want before placing it somewhere. Unfortunately this is manual and there is no pan and tilt feature available within the app. The bottom has a strong magnet and attaches to a metal base that you can screw into the wall. In fact, the camera is so light you could probably get away without drilling holes and just using some double sided adhesive. It really makes mounting the camera on a wall a simple task. While there have been complaints online in regards to connecting the Mini O, we didn’t encounter much in our testing. You’ll need to download the EZVIZ app which is available for both iOS and Android devices. From there, it walks you through the setup which involves using your phone to scan the QR code on the bottom and configuring to your Wi-Fi. It took under 10 minutes and that includes signing up for an account with EZVIZ. At under $40, the camera was going to need to cut some corners and the camera lens is first. The 720p resolution is perfectly acceptable for most people but does fall behind the 1080p Wyze is offering at almost half the cost. Unless you plan on pulling up the video feed on your big screen TV with an Amazon Fire Stick, I don’t think you’ll notice the resolution difference much. The 111 degree wide angle lens however is right in line with the price and gives good coverage. You can zoom in with the app but it gets blurry fast. There are some solid features packed inside the EZVIZ Mini O. Night vision performs well and gives a fairly clear picture at up to around 15 feet. Beyond that it can get a little blurry but still usable. Night vision is triggered automatically based on the light in the room. An impressive microphone and speaker are built-in to the camera and let you listen in on a room or communicate with someone on the other end. The sound quality was much better than I anticipated for a camera that size. Motion detection is arguably one of the more important features in a security camera and the EZVIZ Mini O does a decent job. It does tend to be a little too sensitive even at its lowest setting. This will lead to some erroneous alerts. The alerts however are great and provide a thumbnail so that you don’t have to click through and watch the whole video if a false alarm is sent. The app overall is quite impressive. You can stream up to 4 of their cameras on your phone’s screen at the same time. There are options to change the quality of the feed if bandwidth is a concern. You can take snapshots, toggle motion detection, set schedules, and a slew of other helpful functions. They’ve clearly put effort into it. As we mentioned at the beginning of the review, the one thing that separates the Mini O from other budget cameras at this moment is it’s compatibility with Alexa. Now this might be changing as Wyze announced their version 2 camera will be Alexa enabled. But for now, the EZVIZ is one of the only games in town at such a low price. The EZVIZ Alexa Skill allows you to pull up your camera feed on your Echo Show, Echo Spot, or a Fire TV with a voice command. You can even rename the cameras in the app so that they’ll correspond to the proper room. For instance, changing the name to “Baby’s Room” allows you to pull up the feed by saying “Alexa, show me baby’s room”. This is nice for someone like myself who has an Echo Spot on my office desk and nightstand. Despite the excitement over the Alexa Skill, it doesn’t come without it’s headaches. My Echo device struggled to find the camera at first. It also required some tinkering of the settings and I still haven’t been able to figure out how to get sound yet. But perhaps most importantly, there is a considerable delay in the feed. I’m talking 10-20 seconds. This delay does not occur when viewing the feed directly through the EZVIZ app. Hopefully over time this can be ironed out. Besides Alexa, the Mini O works with IFTTT to provide a number of actions for other smart home devices. For instance, you can have the camera enter sleep mode when you return home and wake up when you leave. If you use Philips Hue light bulbs, they can be turned on when motion is detected. WeMo Light Switches can be triggered through motion as well. It’s not a huge selection, but better than most budget security cameras at the moment. 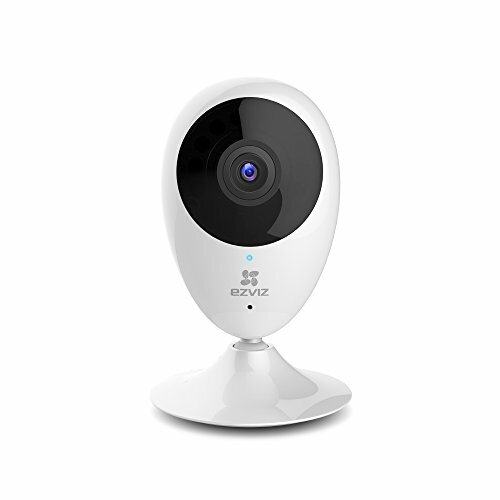 If you’re using one of these cameras for home security purposes, cloud storage is important. Without it, a criminal can simply grab your camera with the microSD card inside and you have nothing. EZVIZ does offer a cloud storage service which unfortunately is a bit pricey compared to competitors. For 7-day playback you’re looking at $5.99/month (or $59.99 a year) while the 30-day playback is $10.99/month (or $109.99). Now this is on a per camera basis. So if you plan to run multiple cameras, it can end up being hundreds of dollars a year. The other downside is that there is no free option. Yes there is a 30-day trial you’ll get to entice you into becoming a long term customer, but after that it’s pay or rely on a micro SD card. Almost every other cam service offers some kind of free cloud storage. Arlo will give you up to 5 cameras and 7 days of recordings for free. Amazon gives you 24 hours and 3 cameras. And even the ultra budget WyzeCam gives 14-days of free access to saved motion alerts. That’s what makes it hard to recommend EZVIZ if you’re using it strictly for home security reasons. Because if you are, you’ll need cloud storage. And if you’re willing to pay money for their cloud storage, you’re better off spending the extra money to buy a higher quality camera that gives you that storage for free (or at a cheaper rate). Now this doesn’t mean the EZVIZ Mini O doesn’t serve a purpose. It’s a perfectly fine baby monitor. It’s a great camera to keep an eye on your pets when you’re gone. Basically any use that isn’t security related. The EZVIZ Mini O is a nice budget home camera that has some solid features. And a year or two ago I’d highly recommend it. But the industry has evolved. Wyze does the same things, has a slightly better camera, gives free cloud storage, and does so at almost half the price. Right now the Mini O has the advantage of that Alexa Skill, but those days are apparently coming to an end. The WyzeCam v2 will launch in the coming weeks with an Alexa Skill of its own. For now I’d hold off on the Mini O until the new WyzeCam is launched. From there you can read the reviews and make a decision. But if the Mini O doesn’t drop in price or provide free cloud storage, it just finishes a distant second place in the budget security cam category.